The growing use of technology has left us vulnerable to an increasing amount of cyberattacks. Have you ever wondered what would happen if you lost your mobile device? Do you know what a cybercriminal can find out about you just by looking at your social media profiles? Often with security and privacy concerns there exist trade-offs with usability and complexity. The most secure user is often the one who doesn't use the Internet, but if you would like to join the rest of us on the Internet, this guide is here to help you. 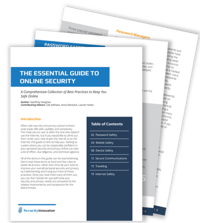 In The Essential Guide to Online Security, you will find a number of best practices for the everday user to help you stay safe online at work, at home, and on the go. Don't be the next victim of a cyberattack. Download The Essential Guide to Online Security now and start learning how to better protect yourself online.